Photo of the day: Sunrise in Seoul. I fell back asleep shortly after this shot. I think we are still running on Thailand time, as we have been sleeping in everyday since we got here. I decided it was ok to be a little lazy since it is Sunday and we have been traveling for 40+ days now. Our laziness is limited by our foodie instincts, so we headed out to Namdaemun Market, hoping to find some good street food. I have been watching a lot of Sweet and Tasty YouTube videos lately and saw that she had such a good time at Namdaemun Market, so I knew we had to go. It was a simple 1 stop subway ride there, which made me wonder if we should’ve walked. The problem is we cannot use Google Maps to tell us how long of a walk it would’ve been to help us decide whether it is a reasonable option. The market was not too big and we covered the whole market in no time. We were disappointed to see that the street food options were more limited during this time of the year. We first tried the donuts with glutinous filling. Some came with red bean and another was winter melon I believe. I really liked the red bean one. The crunch outside and the soft inside was just perfect. Then we got some Ddeokbokki (Korean rice cakes), it was ok but too sweet and saucy. 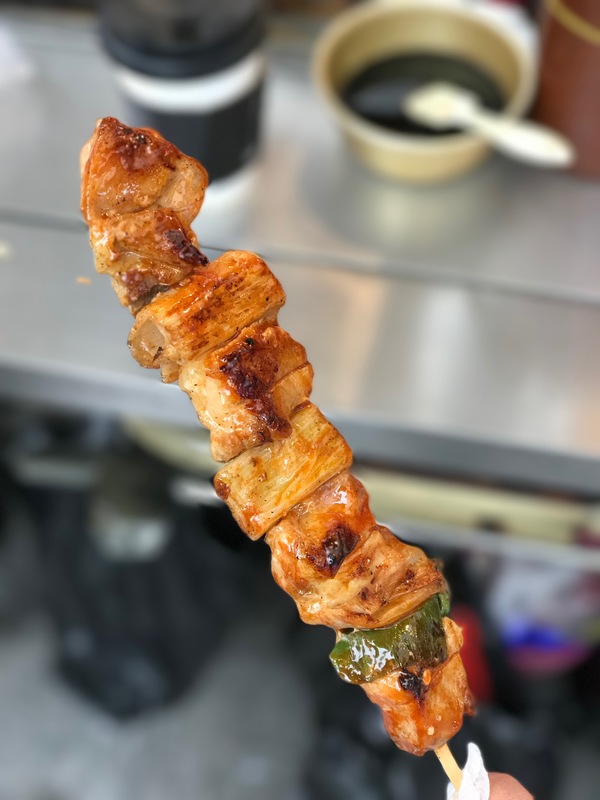 We also got some Dakkochi (chicken skewers) at the same stall. The chicken was alternating with sweet onion, drenched with delicious BBQ sauce. It was very tasty. We ended with some Busan-style Hotteok (sweet Korean pancakes), which was Aaron’s favourite. It was filled with oozing brown sugar syrup and peanuts. Ddeokbokki in Namdaemun Market. Photo credit: Aaron. Dakkochi in Namdaemun Market. Photo credit: Aaron. 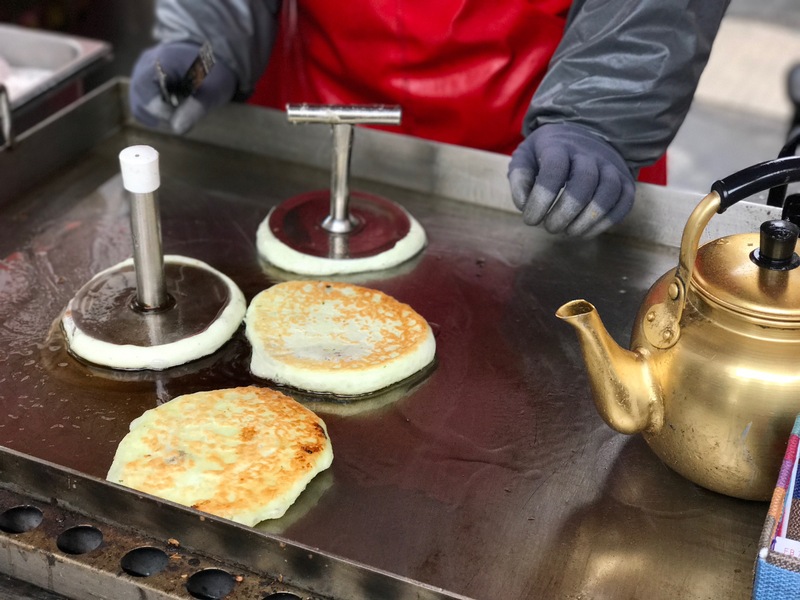 Hotteok in Namdaemun Market. Photo credit: Aaron. Feeling not completely satisfied, we walked down the Hyeondong Underground Shopping Mall to see if there was anything interesting to eat down there. 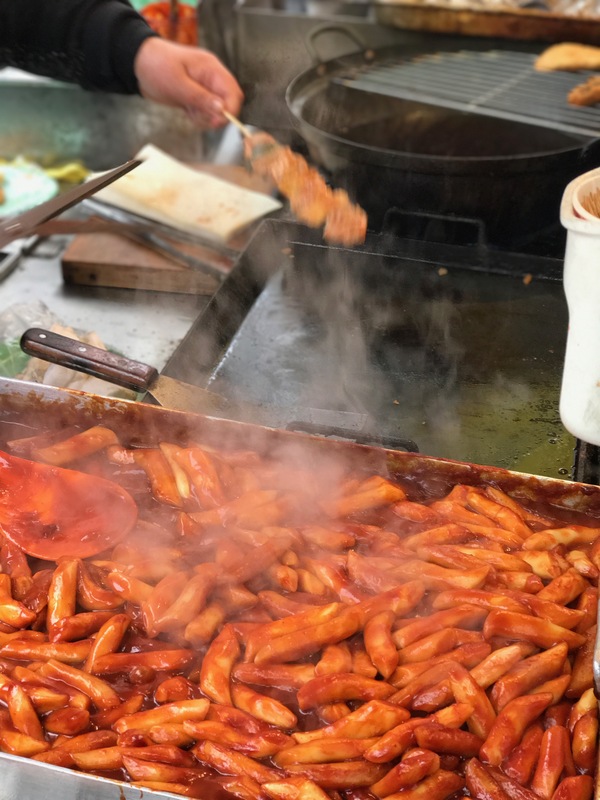 While there, we found out that it led to Myeongdong, so we followed the path to Myeongdong – the shopping and street food paradise that we discovered on the first day we were here. Aaron got to pay another visit to the largest Uniqlo in Seoul, but did not purchase as many things as he originally wanted to. He found out most things were cheaper in Japan, which we will be heading to next. Here, we were finally able to get the immediate tax refund that has been advertised. They simply just scanned our passport, then we were given a discount on the bill. Interestingly, they did not refund the entire VAT amount (10%). It was only a portion of that amount due to a handling fee by the refund company. A friend of a friend of ours who lives in Korea, suggested that we go to a noodle place in Myeongdong called Myeongdong Gyoja (명동 교자). It took us some time to find as we were playing match the Korean Characters again! Luckily, they also listed a Chinese name (明洞餃子), which I was able to recognize. It was a pretty full place but we managed to get a spot right away. The menu was simple with only 4 dishes. As we walked to our seats, I noticed most couples would order 1 noodle bowl along with extra dumplings on the side, so that’s what we did. The service was very efficient and we were asked to pay upfront when ordering, which actually makes more sense because you don’t have to wave the server down to pay later. Our food arrived in no time. Placed in front of us was one huge bowl of noodles with a whole steam basket of dumplings. I was excited. The dumplings reminded me of the Northern Chinese Xiao Long Bao. It was soupy inside and was filled with veggies and meat. The wrapper was perfectly soft and not too doughy. The knife cut noodles again remind me of a very Northern Chinese dish. The shredded meat placed on top was the highlight of that dish. There were small dumplings in the noodle soups but it wasn’t as plump and delicious as dumplings from the other dish. We got some pretty spicy kimchi on the side as well, which was refilled as we ate from this lovely lady with a small thermos of kimchi. 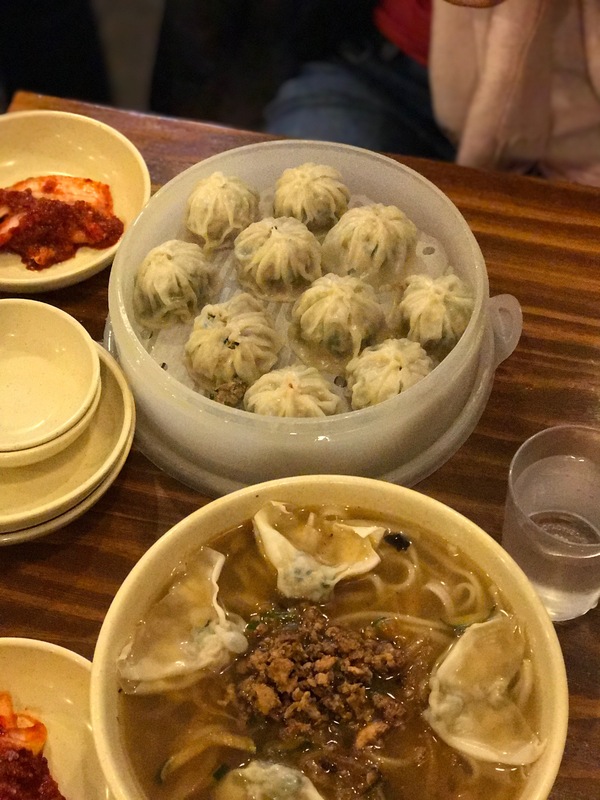 Dumplings and noodles @ Myeongdong Gyoja. We did some more window shopping around the area and I was finally overwhelmed with the sales efforts here, so decided to call it an early day. If you are like me, and enjoying taking my time when shopping and do not like to be bothered by hard-selling techniques, this is not the place for you. As soon as you walk into a store, the salesperson would follow right behind you and start promoting products. I appreciate their helpfulness but even when I say, “it’s ok, I’ll just look around”, they would continue following me. There was one salesperson who was trying really hard to make me buy a 20 pack of snail masks that she started offering me 20 more masks and some other snail cream as well. I tried to explain that I have no room or weight allowances in my little carry-on but she insisted I get them. I was almost pressured into getting it since she spent so much time on me but I eventually said no thank you and walked away. Now, I can see why so many people are carrying suitcases with them to come here shopping. You would need it if you end up buying everything they sell you and all these extra gifts they offer. 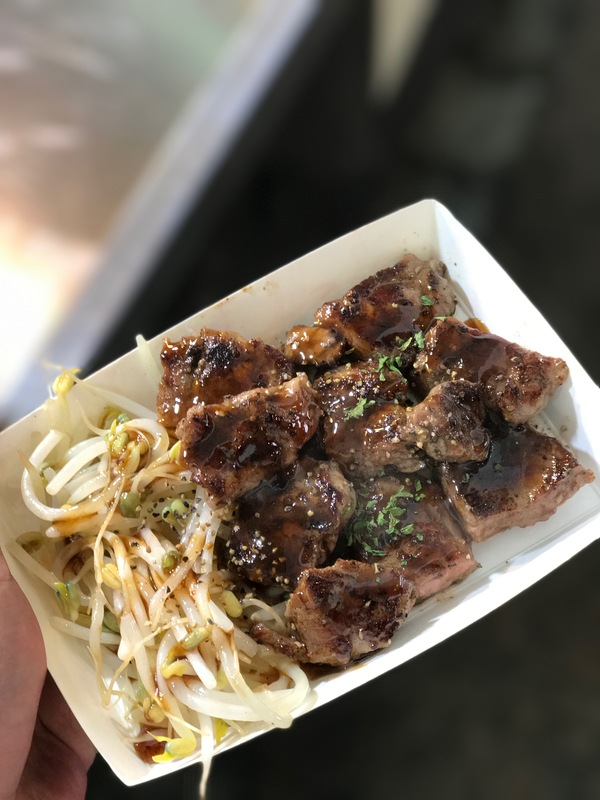 There was a street stall that was selling teriyaki steak, which smelled so good, so we picked up some to fill our tummies for the day. Aaron enjoyed the croissant Taiyaki so much from the other day that we had to grab another one to wrap up the evening. Steak in Myeongdong. Photo credit: Aaron.